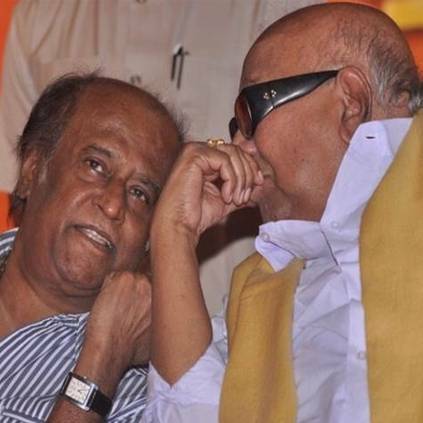 IS RAJINIKANTH MEETING KARUNANIDHI TODAY? DETAILS HERE! Actor Rajinikanth is currently acting in the untitled film with Karthik Subbaraj. The film features other top stars like Vijay Sethupathi, Bobby Simha, Simran. Young Sensation Anirudh will compose the music for this album, that has Vivek as the lyricist. The latest update on the film is that Rajini's portions for the schedule in North India has been completed. The Kaala star will be returning to Chennai today. Rumours were afloat in social media that he will be meeting the ailing DMK Leader M. Karunanidhi at Kaveri Hospital. However sources close to us have revealed that he has not yet planned his hospital visit after reaching Chennai, but it is expected that Superstar will soon meet the DMK Supremo, as they share a great bonding over the years. It must be remembered that Rajinikanth last met Karunanidhi on January 3 after the latter decided to plunge into politics and took the blessings of the experienced leader. Rajinikanth announced his political arrival on December 31 last year during his routine fans annual meet. Rajinikanth was last seen in Pa Ranjith's Kaala. Apart from the Karthik Subbaraj film, he is also awaiting the release of the much awaited 2.0, which is the sequel of Enthiran, both directed by Shankar. Enthiran was a huge blockbuster when it released in October 2010. Kalaignar Karunanidhi ICU Visuals From Kauvery Hospital! People looking for online information on Bobby Simha, Karthik Subbaraj, Karunanidhi, Rajinikanth, Rajinikanth - Karthik Subbaraj film, Simran, Vijay Sethupathi will find this news story useful.